Thank you, thank you, so much. A shot of oxytocin this morning just to make sure there was nothing left inside… and she’s happy being Momma. 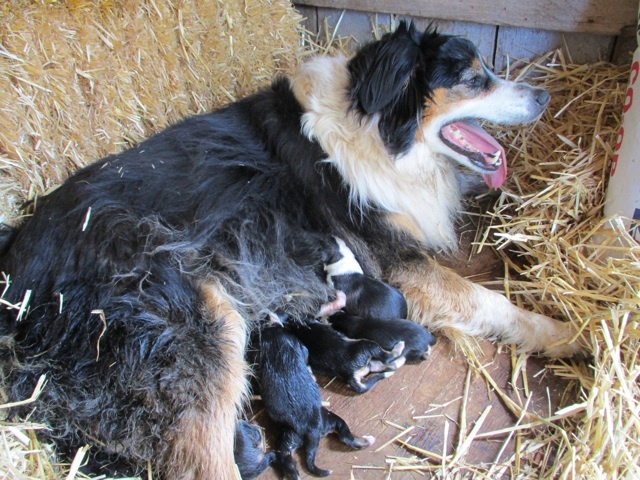 Five puppies… 4 girls and a boy… and they seem like they’ve grown already! Four, for sure, are tri-colors. The firstborn, a large girl with a wide white blaze and a glorious star in her forehead, at first glance looks like a tri. Shepherd spots, tan cheek patches, tan legs… but only her spine is black black, her sides look like a really dark shaded sable! She’s going to be interesting to watch and see what her color does. Another one also has a star… the little one *could* have had a star if just a smidge of white would have cooperated. One has a “creative” collar and blaze, and the male has nice markings as well. And, oh, yeah… A WEDDING. June 2, 2008 no entry.